The cuts will seriously undermine access to justice and sidestep the obligation of Government accountability. The cuts will affect the most disadvantaged and vulnerable in society and allow unlawful and unfair public body decision-making to go unchallenged. The Equality and Human Rights Commission’s analysis in 2012 warned that reducing the scope of legal aid in a substantial number of areas in civil and family law will create serious practical barriers to access to justice, potentially in breach of Article 6(1) of the European Convention on Human Rights (ECHR). The cuts to the civil legal aid budget, which came in to effect from April 2013, mean many cases, including those about debt, private family law, employment, welfare benefits, clinical negligence and housing problems are no longer eligible for funding. This is at a time when the Government have implemented other radical, controversial and contentious cuts to health, education and welfare, and it is no coincidence that the legal aid Bill will curtail justice for those with legitimate needs at a time when draconian Tory policies such as the bedroom tax will most likely result in a massive increase of numbers of people needing and seeking redress. This will mean the compounding of effects of other fundamental human rights breaches, legally unchecked, because of the profound impact of multiple, grossly unfair and unjust Tory-led policies. Each policy hitting the same group of citizens, to their detriment, over and over. This sends out a truly worrying message to those of us who believed we lived in a first world liberal democracy (one that has recognition of individual rights and freedoms embedded in its Constitution, and one in which decisions from direct or representative processes prevail in State policies.) The promotion of equal opportunity to legal justice is the bedrock of a free and democratic society. It ought to be inclusive of all who cannot afford to be tried fairly. The reality is only a few can afford the legal costs to enforce contracts and against criminal prosecution. This profoundly unjust inequality is not something we expect to see in a Country which was once a beacon of Western liberty. Even if we were to take a Conservative perspective, it’s still the case that the only way to wed the principle of a “pursuit of economic liberty” with wider justice is by a basic notion of equality before the law, through the equal access to justice. This means that the State must fund the means of contract enforcement and free and fair trial legal costs, for those who cannot afford it. If the State fails to fulfil this contingent function, then we simply cease to be free. “Legal aid will continue to be provided to those who most need it, such as where domestic violence is involved, where people’s life or liberty is at stake or the loss of their home. But in cases like divorce, courts should be a last resort, not first. Evidence shows that mediation can often be more successful and less expensive for all involved.” – Chris Grayling. Section 10 of LASPO (Legal Aid, Sentencing and Punishment of Offenders Act 2012) provides the new Director of legal aid casework with the power to provide ‘exceptional funding’ for cases that are out of scope. Part 8 of the Civil Legal Aid (Procedure) Regulations 2012 indicates that providers of legal services will not have delegated powers to grant exceptional funding. Instead, an application must be made to the Director for an ‘exceptional case determination’. b) that it is appropriate to do so, in the particular circumstances of the case, having regard to any risk that failure to do so would be such a breach. This misses a very crucial point: it’s very dangerous to allow the State to decide which cases constitute the most need. In a free, democratic and fair Society, each and every single individual has equal legal worth and entitlement to opportunity to bring about legal justice. The Government choosing which cases are most “worthwhile” undermines this very premise of legal equality which is so fundamental to the notion of liberty. Everybody has a right to take any grievances they have, which have invoked legal ramifications, to court. Everybody ought to have an absolute, inalienable right to free and fair trial in a free, democratic and liberal country. Having cut the civil legal aid budget by £320m, the Ministry of Justice proposes to cut the criminal legal aid budget by a further £220m. Legal contracts are to be based on competitive tendering. One of the outcomes of the reform and cut to the budget is that defendants on legal aid will no longer be offered a choice of solicitor. One of the most unfair aspects of this system is that if you are charged, the State will select a prosecutor with specialist experience in that area of the law, funded by the taxpayer. Be it a sexual offences case, a road traffic death, a murder, a drugs case or a serious assault, in each case, a prosecutor will be picked to prosecute you from a specialist team. But when it comes to your defending yourself, however, you will be given no choice. You will either have the defence lawyer allocated by the State or you will be on your own. This cannot be right. Many legal experts have voiced their alarm at this, because it will invariably lead to gross injustices. Large commercial firms who are going to be paid, win or lose, will have a vested interest to encourage their clients to plead guilty, whether they are or not. At a time when people are at their most vulnerable they need a local service that listens, not a business, whose goal will be to turn around the case as fast and cheaply as possible. 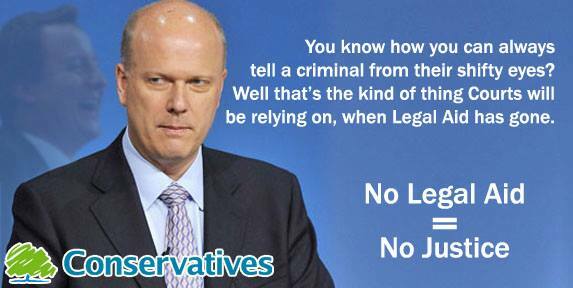 The scope for dangerous consequences due to vested interests in the justice system following Justice Secretary Chris Grayling’s “reforms” is considerable, and allows potential for further erosion of legal freedom. In some cases, the sole choice of lawyer for a defendant via legal aid will also be a representative for the organisation with an interest in ensuring a prosecution. The tendering process – where the cheapest bid wins – would be run by companies with no record of providing legal services, resulting in a dumbing down of the profession and a race to the bottom that will mean citizens being denied access to quality legal aid. As is always the case when private companies that are driven solely by the profit motive are involved in any service, cases will be run on the cheap by under-qualified, inexperienced, low-cost staff. The company Serco, for example, provides prison security guards. 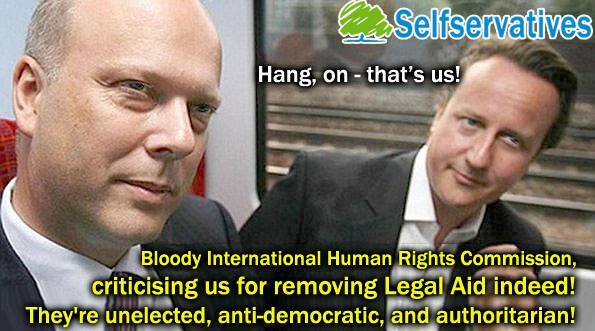 Serco is one company bidding for the legal contracts with the Legal Aid Agency. The Department of Justice has proposed to remove defendants’ automatic right to select their own solicitors to make the contracts to bidders more profitable. I have no doubt that the Coalition wants to see access to justice removed for those affected by its nightmarish, dystopian policies. Those people affected most of all are some of our most vulnerable citizens, as the cuts have been disproportionately aimed at the poorest, at sick and disabled people, and those who are unemployed. Injustice increases and extends vulnerability, especially for those groups of people already experiencing marginalisation. We need look no further than Clause 99 of the welfare “reform” Act to see how silencing those seeking redress is a priority for this Government. This is also about hiding the evidence of the dire consequences of the “reforms”, since large numbers of successful appeal outcomes highlight, for example, that the Work Capability Assessment (WCA) is grossly unfair and widely inaccurate. Yet despite almost 11,000 deaths, many of which have been attributed to the stress of the assessment process itself, and to people being wrongfully assessed, the Government have not even instigated an inquiry into the WCA. Had an auto-mobile been associated with such a high number of deaths, it would have been withdrawn. Yet we still have the WCA, and incredibly, no willingness for an investigation from our perennially indifferent Tory-led Government. Those wishing to appeal wrongful decisions by Atos/The Department of Work and Pensions (DWP) that they are “fit for work” after having their Employment Support Allowance (ESA) unfairly removed will find that this will be an almost impossible task, since their right to legal aid has been removed. The introduction of the Mandatory Review in Clause 99 will mean that they have to wait an indefinite period without any ESA sickness benefit, or claim Job Seekers Allowance (JSA), whilst waiting for the DWP to conduct the review, with no time limit imposed on the DWP to do so. That means signing on and declaring that you are fit for work, and people are being told by the DWP, unbelievably, that they don’t qualify because they are not fit, or fully available for work. Others have been told that to claim JSA they need to close their ESA claim which means they cannot appeal a review decision. Basic rate ESA is exactly the same amount of money as JSA, so the Government cannot even claim this is a cost-cutting move. 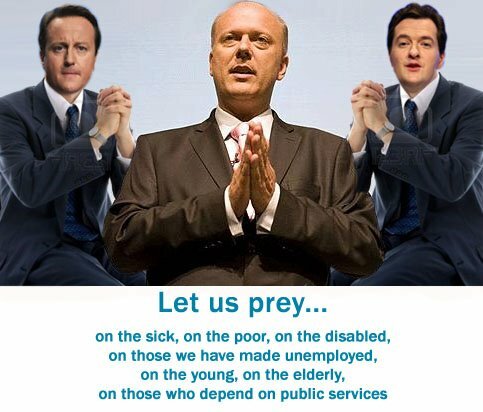 And we also know that Atos are contracted by the Government to make “wrongful” decisions. The right to a lawyer of a persons’ choice, regardless of your income, race, gender or nationality, is an underpinning condition of a free and fair justice system. Having both a sense of, and access to choice over one’s legal representative, who is there to fight for justice is paramount to basic legal equality and liberty. When this choice is removed and legal representation is essentially imposed on a passive defendant by the State (if a defendant can still access legal aid at all, that is,) our justice system becomes unacceptably authoritarian. Update – In response to this article, a statement has been issued from the International Human Rights Commission, who say: “The IHRC strongly condemned the Bill and asked the UK Government to consider this action, which is against the norm of human rights”. I agree from another Jenny here about we live under dictatorship now. This is terrifying. The sick, disabled, poor and unemployed have totally been silenced. We have no voice. Gov took away our voice deliberately. No one is listening anyway!!! To take away legal aid and dismantle and breech human rights is a stealth insidious callous act. This is the act of a street fighter going below the belt. I am also amazed at the hostility of my local council and aggressive council tax demands I am getting EVERY day. I simply do not have this money. I despair now. It is like bashing your head against a brick wall. What on earth are people going to do when winter 2013 comes?? Hope it will be a mild winter. How will people pay their heating bill??? Apparently I watched a programme called Human swarm last week. Yes, I do still own a TV, just about. Bailiffs not been just yet. The programme stated that there is a rise in heart attacks when the weather gets cold. Apparently blood thickens when we are cold. So very important people keep warm in winter. Especially sick and disabled people. I have grave concerns for people next winter. Something has to be done soon, or there will inevitably be more deaths.